Short report today. Yesterday was sunny, bright, but extremely windy. A Rough-legged Hawk was reported early yesterday morning circling over Hall School Road in Stuart's Draft, just over the other (west) side of the Blue Ridge Mountains. This morning was also sunny, with much calmer winds, so I decided to see if this hawk was still there. The reported location was right where I had seen one in 2010, 2011, and 2013, but not at that locaction since then. In fact, Rough-legged Hawks, always rare in Virginia, have been seen few and far between during the past few years anywhere around here. I suspected that this hawk may have been migrating and blown into the area yesterday by the strong winds, knew that Hall School Road was a good foraging location, and perhaps might stick around for a few days. 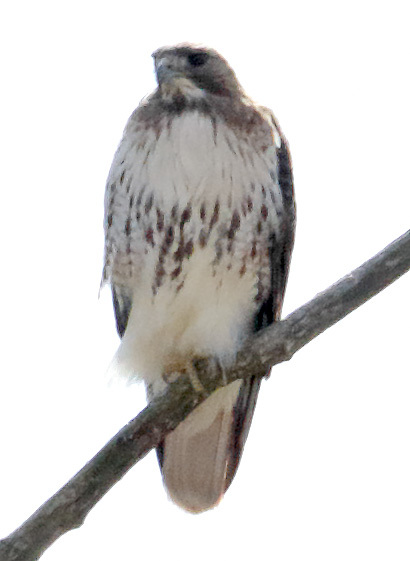 I didn't see the hawk as I drove to all of my usual birding sites in the Stuart's Draft area. 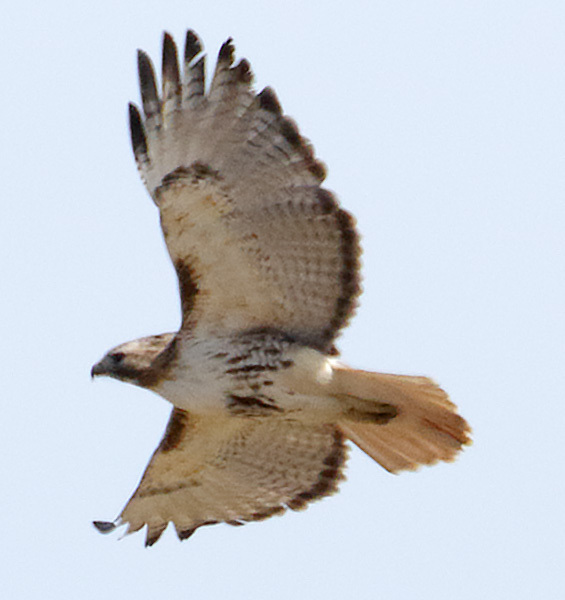 If fact, although I finished up with 20 avian species, except for three Turkey Vultures, I didn't see any raptors until I saw a single Red-tailed Hawk as I was leaving the area. 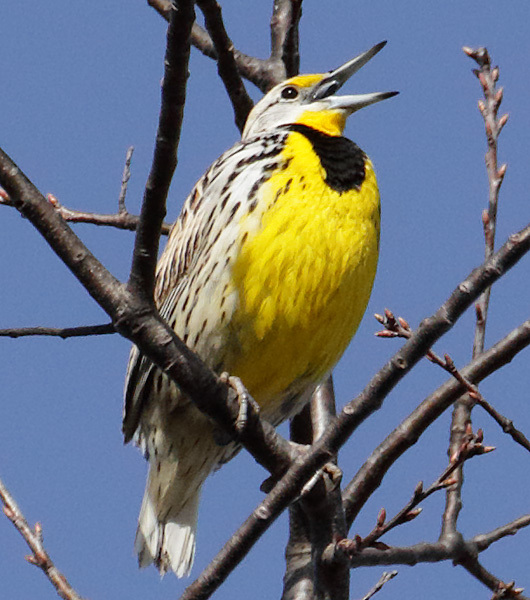 The best birds of the trip were singing Eastern Meadowlarks. On my trip back to the east side of the Blue Ridge Mountains, I stopped to try some birding on the first five miles of the Blue Ridge Parkway. I knew that that there would be very few birds there until the beginning of May, but I wanted to look for owls that might be nesting there, and for American Woodcocks that breed just past mm. 5. But when I got to the parkway entrance and saw all the cars parked there, I guessed what had happened. The parkway was closed, probably due to downed trees by yesterday's winds all along the parkway. I decided to try Route 610 that runs parallel to the first four miles of the parkway before heading down and west into the Shenandoah Valley. 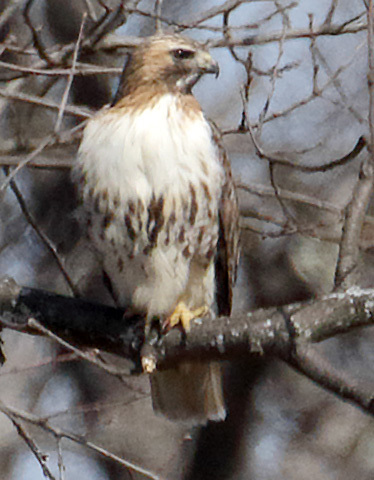 It was fairly quiet, but I got another Red-tailed Hawk.